Philanthropist R. Randall Rollins received an honorary doctor of humane letters degree at Emory University's commencement ceremony in May. 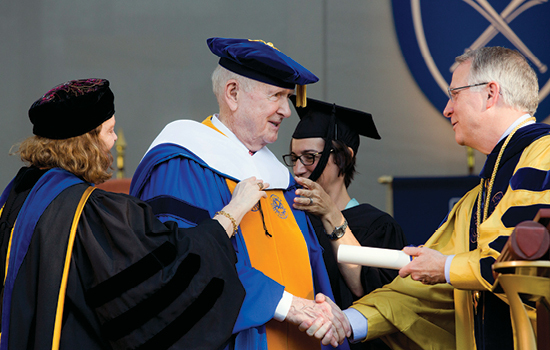 Rollins, chairman of the board of Rollins, Inc., is one of Emory's most generous living donors. In addition to unprecedented moral and financial support and leadership to the School of Public Health, gifts include support of the Robert W. Woodruff Health Sciences Center, the Emory School of Medicine, the Winship Cancer Institute, Yerkes National Primate Research Center, and the Candler School of Theology. Randall and his brother, Gary Rollins, made generous lead gifts that enabled the construction of the two buildings—the Grace Crum Rollins and Claudia Nance Rollins buildings. They gave unrestricted gifts that enabled the Dean to endow the chairs of three departments and provided funding to help launch the careers of promising junior faculty. In addition, the family established the Center for Public Health Preparedness and Research after 9/11 and endowed the Wilton Looney Chair of Cardiovascular Research. With this support, Rollins continues the mission of the O. Wayne Rollins Foundation, created in 1967 by family patriarch Wayne Rollins and his wife, Grace Rollins. "Now recognized as one of the nation's leading schools of public health, the Rollins School of Public Health's worldwide reach would not have been possible without the generosity of Randall Rollins and his family," says Dean James Curran. "Today, more than 8,000 Rollins alumni hold leadership positions in more than 100 countries. More than half live in Georgia, substantially increasing the expertise of our public health workforce. Ten percent serve the world as dedicated employees of the Centers for Disease Control and Prevention. Countless thousands throughout the world will lead longer, more productive lives because of Randall Rollins' investments in public health."